About You: I love exploring the urban and creating narrative-based architecture. I believe that architecture has an element of time that is best captured by the narratives and the lives we live through them. This being said, factors of material ontology, Memory of space and the pedagogies that govern Architecture/Design are always a part of the design processes I undertake. Let playgrounds guide us, let It become a tool. The aim of the Project to question an art residency and how the art world views its artist residents and their places of dwelling. I then move on to create architectural toys and games, by using the reference of Bevin court in London and it's marvelous frontal nature and core planning properties to create a fidget toy for architects to explore and simulate the subconscious mind. A game of redundancy which is derived from Duchamp's favorite game of Chess, This teaches the architect the means to order objects. The third move was creating artist dwelling units on the roof of MoMA QNS where the residents not only dwelled but also showed their process as a subset of living in a challenging environment. The units comprised of penetrating a solid with the memories , forms , shapes of everyday objects, furniture, and patterns to arrive at sliceable moving units. These units also represent what Duchamp called the Museum in a Briefcase , a Satire of sorts to implicate that a museum could be enclosed within a Briefcase. The result is an intervention and rebellion towards current residencies and a playful gesture of what truly gets artistic notions into a place and space. This allows for one to have a playground of explorations. Marcel Duchamp’s suitcase dated 1965 found. 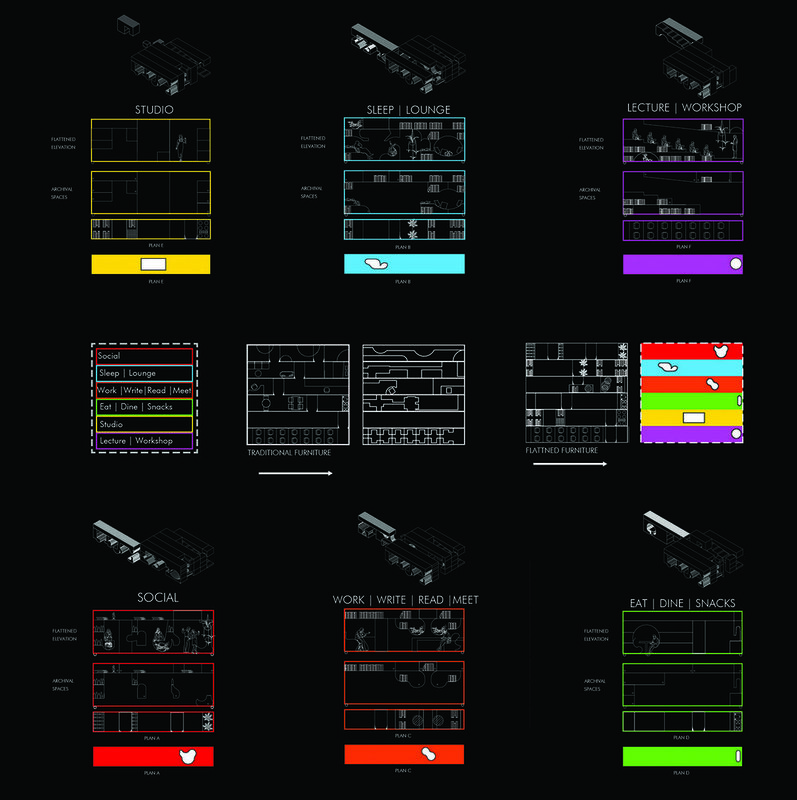 With exclusive blueprints of a Non – Museum. Non-Museum: Towards the end of his career Duchamp made a miniature of all of his work’s and announced that each artist could be portable (museum in a suitcase) and rendered the idea of a museum redundant. 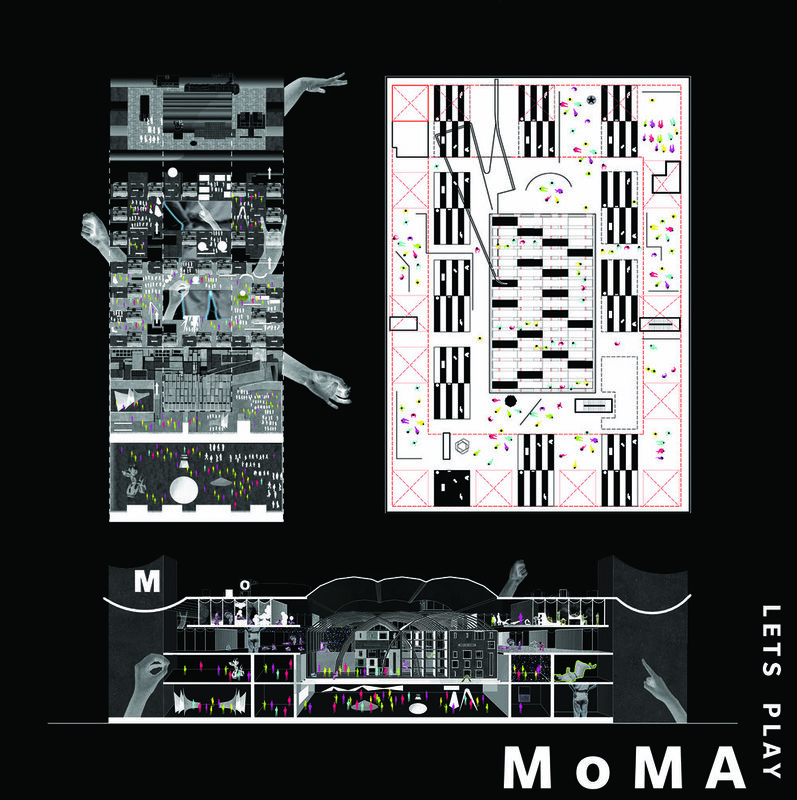 The blueprints tell us about an inventive approach to architectural genealogy by using game theory that plays with the idea of public and private spaces within the museum. His obsession with the game of chess reciprocates his design process of orienting and disorienting objects and spaces in various narratives. This intervention is supported by MOMA’s illusionary internal facade that acts as a chessboard-like device allowing the possibility of being in the artwork or being in the process of the production of the artworks. These domestic and workspace inserts constantly interact between different museum environments, Fostering an archive of living thoughts and those represented. Atmospheres of Non-institutions, what would they look like? Where will the power reside? Will power mean owing a new commodity again? We must disorient commodity. Disorient consumption. These fetishes should be made into monuments which is the only way of killing it..
To learn from them but not be encapsulated by them.. The suitcase of memory must be redefined.